On November 13, 2018, the Bishops’ Council of the Ukrainian Orthodox Church was convened at the Kyiv-Pechersk Lavra. This is the largest Christian denomination in Ukraine in terms of both the number of parishes and the faithful and is canonically recognized by all the Orthodox Churches in the world. Following the results of the Bishops’ Council of the UOC, an official resolution was adopted, the full text of which is available on the official site of the Church. “The Council of Bishops opposes any attempt to change the name of the Ukrainian Orthodox Church, as has already been declared by senior government politicians, and by other manifestations of discrimination against the faithful of the Ukrainian Orthodox Church at the legislative level. If the relevant bills are adopted by the Verkhovna Rada of Ukraine, the Ukrainian Orthodox Church will protect its rights by all legal means provided for in the “Fundamentals of the Social Concept of the Ukrainian Orthodox Church”, the legislation of Ukraine and the European Convention on Human Rights”. Draft Law No. 5306 provides for a number of amendments to the current Law of Ukraine “On Freedom of Conscience and Religious Organizations,” in particular as regards the forced change of the names of religious communities of the Ukrainian Orthodox Church in their statutory documents. In practice, the implementation of these precepts implies religion-based discrimination against Ukrainian citizens, parishioners of the UOC. It also creates additional risks of raider seizures of religious buildings in Ukraine, as it will allow the state to invalidate the existing agreements with the communities of the UOC to lease and use churches. At issue are primarily the Kyiv-Pechersk Lavra and the Pochayiv Lavra, as reported by the head of the Synodal Law Department of the UOC, priest Alexander Bakhov. 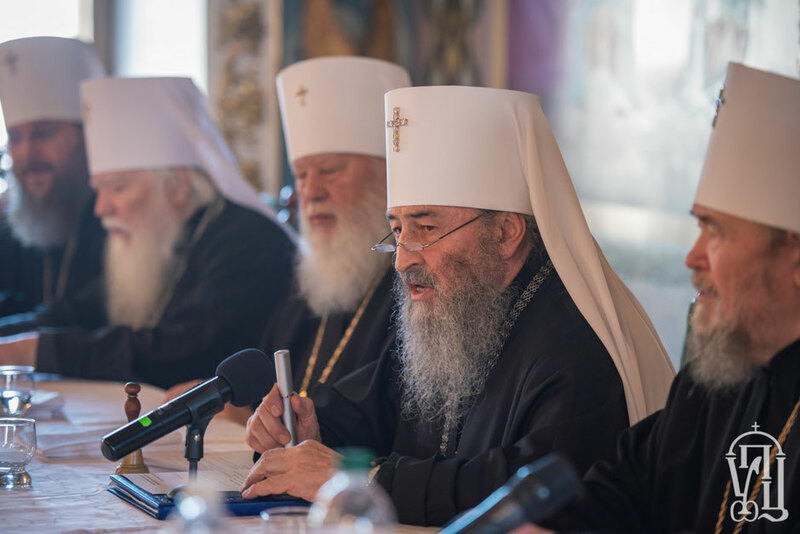 At the same time, the leader of the self-proclaimed Kyiv Patriarchate Filaret (Denisenko), unrecognized by the majority of the Orthodox Churches in the world, insists on the adoption of the said discriminatory legislative precepts. Similar ideas, according to media reports, have repeatedly been expressed by Ukrainian Foreign Minister Pavlo Klimkin, Director of the Department for Religious Affairs and Nationalities of the Ministry of Culture Andriy Yurash, Verkhovna Rada Chairman Andriy Parubiy and other statesmen. Other official documents on the religion-based discriminations against Ukrainian believers adopted by the Holy Synod of the Ukrainian Orthodox Church are available on the following links: DECISION 17 OF THE HOLY SYNOD OF THE UKRAINIAN ORTHODOX CHURCH AS OF SEPTEMBER 25, 2018, DECISION 18 OF THE HOLY SYNOD OF THE UKRAINIAN ORTHODOX CHURCH AS OF SEPTEMBER 25, 2018, RESOLUTION OF THE BISHOPS’ COUNCIL OF THE UKRAINIAN ORTHODOX CHURCH OF NOVEMBER 13, 2018.